How must sustainable financing products be further developped so that they stimulate investments in renewable energy? Due to the „kleine Ökostromnovelle“ (minor ammendment to Austria's green electricity laws), which business models could be suitable for private photovoltaic use in apartment buildings? How can Energy Contracting be made more attractive? How can current support schemes be optimised? Which tax incentives can be applied to the area of energy efficiency in buildings? Christopher Milin (EASME) and Martin Brunkhorst, European Investement Bank, gave keynote presentations (please see below). Doris Schnepf (Green4Cities) reported on the positive effects on energy consumption in buildings by making them greener and a planning tool developed for this purpose. The SEFIPA-Team (OEGUT and Energy Changes) would like to thank the working group stakeholders for their engagement! Many thanks for the numerous submissions to the Call for ideas! We asked for your ideas for new financing solutions or changes to the legal framework for sustainable energy projects (renewable energy, energy efficiency). The SEFIPA-Team has selected three ideas on the basis of innovation, feasibility and effectiveness potential. The selected ideas will be presented as part of the Finance Lab working group meeting with stakeholders from the areas of financing, (financial) support, administration and project development to drive these suggested solutions forward and in the best case, to realise them. GREENPASS®- Technology, Doris Schnepf, Green4Cities: the topic here is improving the potential use of green infrastructure on buildings via a planning tool (also certification) in order to improve energy consumption and consequently quality of life. The intergration of renewable power generation units and creating incentives for the acquisition of decentralised storage solutions at the source of generation, Stefan Übermasser, Austrian Institute of Technology (AIT): for further integration of renewable energies and to create incentives for decentralised storage solutions (optimised for private-use), it has been suggested to introduce strict performance limits and staggered service delivery tarifs for end-customers, through which peak loads are flattened. Sustainable energy and agriculture, Johannes Naimer: Suggestion for a modification or at least an exemption rule for the OeMAG-Einspeiseregeln (feed-in tarifs), through which wind power operators can sell »ex work« electricity. This could open up new opportunities for the decarbonisation of agricultre via for example plug-and-play solutions or battery charging for future e-tractors etc. 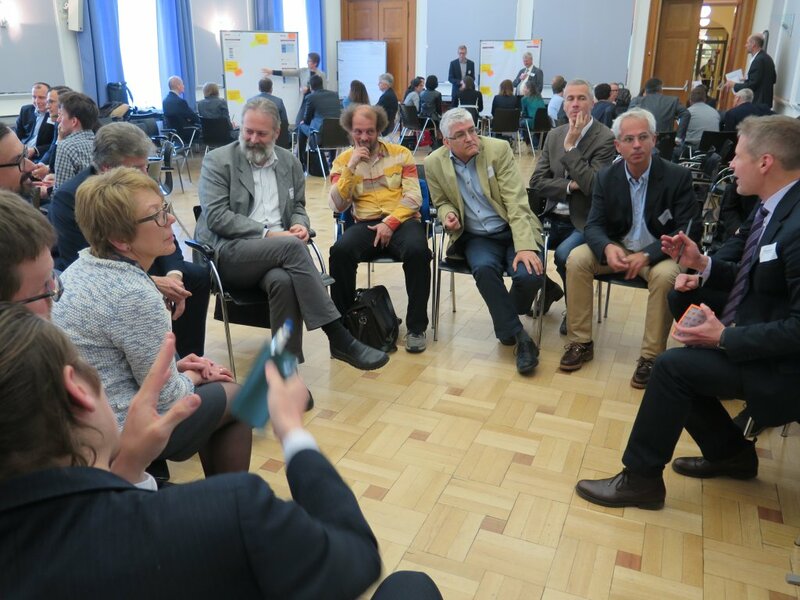 The Global 2000 expert workshop (which took place on 14.12.2016 at Albert Schweizer Haus in Vienna) was centered around the topic "Crowdfunding for renewable energy - a great opportunity for Austria?" The workshop was part of the project "Crowdfundres", supported by the EU Commission's Horizon 2020 programme. You can find further information about this project under www.crowdfundres.eu. International experts highlighted the topic of "crowdfunding" firstly from a legal standpoint and also presented best-practice examples of crowdfunding for renewable energy. Katharina Muner-Sammer (OEGUT) and Oliver Percl (Energy Changes) introduced the new crowdfunding platforms crowd4climate and crowd4energy. The new crowd4energy platform is part of the SEFIPA project and will be launched soon. Sustainable energy projects in Austria for this platform are currently are being looked for. Since the SEFIPA kick-off event in June 2016, five working groups comprising approximately 40 stakeholders from administration, project development, finance and interest groups have been formed, which all work towards the realisation of energy efficiency projects and renewable energy. The working group "Sustainable Energy Financial Products for Institutional (and private) Investors" focuses its attention on the question of how financial products within the area of sustainable energy should be designed so that they will be asked after by institutional investors and further whether these new financial products should be offered on the market. This working group is overseen by Susanne Hasenhuettel (susanne.Hasenhuettel@oegut.at) and Katharina Muner-Sammer (katharina.Muner-Sammer@oegut.at). The "Making Energy Contracting More Attractive" working group is first of all focused on building up a professional network of "contracting mentors". This working group is also concerned with clarifying the question surrounding the "Maastricht-neutrality" of public contracting projects, which is a fundamental prerequisite for a properly functioning market in this sector. This working group is led by Monika Auer (monika.Auer@oegut.at). The working group "Incentives for Energy Effieicency Measures in Buildings" takes on the topic of energy monitoring in buildings and aims to draft guidelines in this area. Furthermore draft legislation for tax law is compiled and positioned. As a whole the topic of energy efficiency should be made more attractive for the real estate industry and the refurbishment of building stock should be increased. Gottfried Henesis (gottfried.Henesis@energy-changes.com) is the leader of this group. The members of the "Strenghthened PV-Usage for Multi-Family Houses" working group work towards making the use of photovoltaic technology within multi-family houses more attractive. One instrument to achieve this is increasing the private use of PV electricity in such buildings. Alongside text-based recommendations on this topic for the planned amendment to the "Electricity Sector Act" in Austria, concrete business and operator models for the private use of PV are under development. Gerhard Bayer (gerhard.Bayer@oegut.at) is responsible for this working group. The working group "Optimisation of Energy-Related Funding Systems" is concerned with stimulating concrete changes in funding guidelines to include innovative financing models (leasing, contracting etc) and to make a combination of funding sources possible. A further focus is on aggregating small-scale energy efficiency projects so that they are more attractive from a financing perspective. Clemens Ploechl (clemens.ploechl@energy-changes.com) leads this working group. The five working groups had their first meeting (Finance Lab) in September and October 2016. The first (interim) results will be presented to the public at an event in Spring 2017. Until then, work will continue on the new crowdfunding platform Crowd4Energy, which is a further milestone of the project. If you have any questions or comments for the working groups, please contact the individual contact partners within the SEFIPA Team! 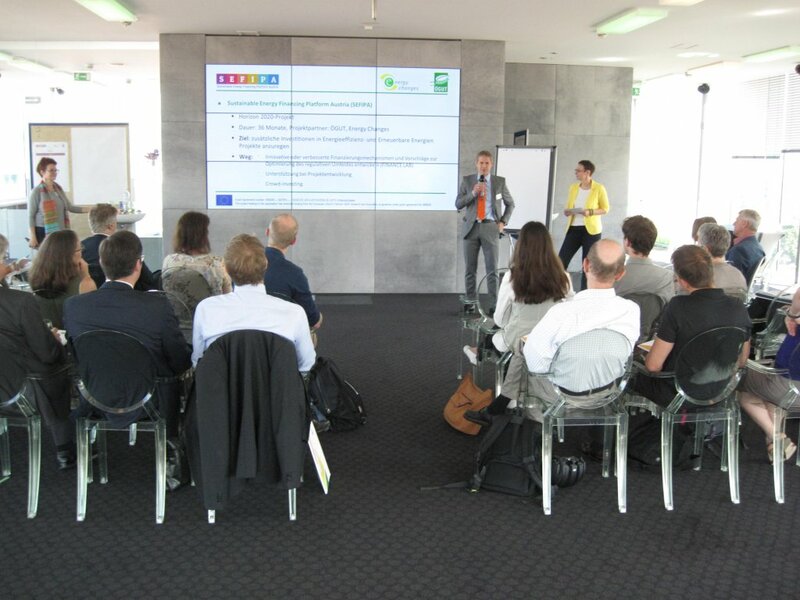 The SEFIPA kick-off event was held on 23rd June in k47 in Vienna. Approximately 40 invited experts from the fields of administration, project development, the finance sector and interest groups discussed various suggested topics that could drive the realization of energy efficiency projects and renewable energy. The first suggested topics ranged from the establishment of an energy efficiency fund to making energy contracting more attractive to measures to enable the private use of photovoltaic energy in multi-family houses. Over the next two years concrete solutions will be developed within the scope of Finance Labs (working groups). Any extra investments triggered by the project should be an important contribution to the implementation of Austrian climate change goals. 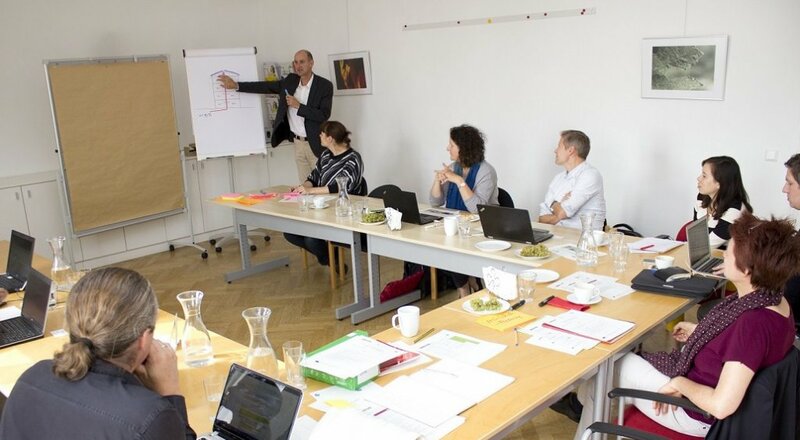 The project "Sustainable Energy Financing Platform in Austria" (SEFIPA) is organised by the OEGUT together with Energy Changes and is financed by the EU Programme Horizon 2020. The documentation from the SEFIPA "project kick-off" event are available for download! 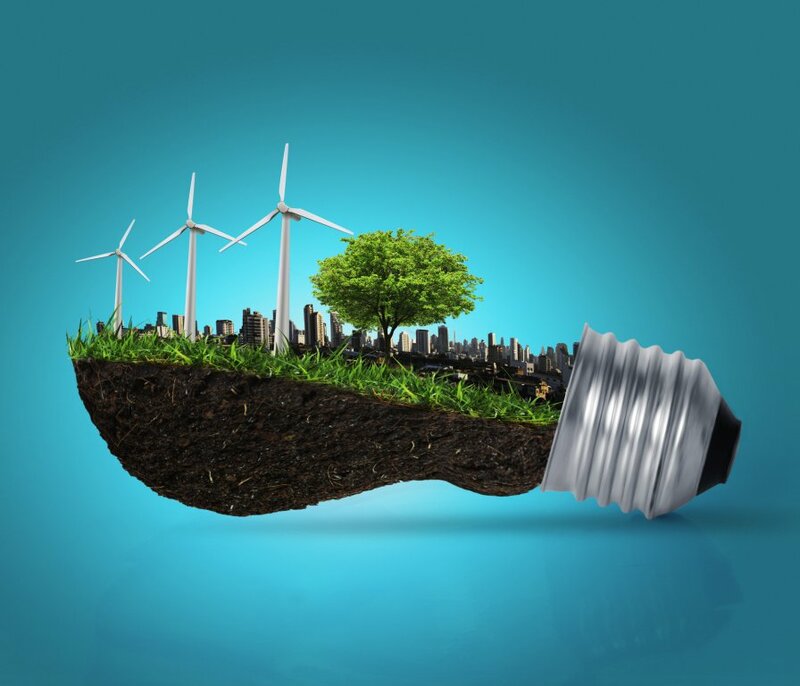 Call for ideas for more investment in sustainable energy! Within Finance Lab, renowned experts work on innovative solutions for better conditions for the financing of sustainable energy projects. We invite you to share your ideas on the topics of financing and legal framework conditions with us and thus to contribute to the creative process.